AmeriCool commercial air conditioning units are an excellent option for the intense needs of industrial and commercial level cooling. Whatever your cooling needs may be, these units work without all the typical hassle of setting up tedious and time-consuming cooling systems. Our air conditioners are designed for even the harshest environments, though they are ideal for a multitude of different situations such as “mission critical” needs of the most highly technological applications, data center cooling or computer room cooling, along with many different industrial requirements. Portability and ease of use are a very important part of all AmeriCool’s units. Our air conditioners all feature washable filters along with spot cooling and room cooling thermostat settings to allow the unit to work at its best in any situation. In spot cooling mode, the temperature set point is based on the supply of cold air leaving the side of the machine. Subsequently in room cooling mode, the temperature set point based on the return air coming into the portable AC units. These versatile portable cooling systems are ideal for a host of applications including computer rooms, hospitals, process cooling, multi-workstation cooling, special events, and even emergency short term cooling needs. Our portable air conditioner units cool to 64 degrees, surpassing the ideal cooling temperature for all “mission critical” requirements (at least 68 degrees). 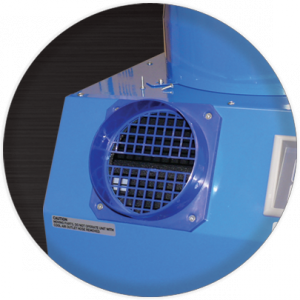 Cold air nozzles can be replaced with an included grill depending on the specific requirements you have for the unit. AmeriCool's product line of portable air conditioner for data centers are easy to install and come with hot and cold ducts that are easy extendable to reach any place you need cooled. A regular washing and cleaning of the air filers is the only recommended mantenance. Each cooling system comes with a self-diagnostic system, providing ease-of-use and convenience. The key to convenience is providing ease-of-use without sacrificing quality and the quality - this and customer service is the number one priority of AmeriCool. We are also backed by one of the industry's leading warranty rates. There are many different features that set our industrial portable air conditioners apart: the ultimate portability and simplicity. All AmeriCool units are equipped with an automatic restart function along with a self-diagnostic capability. This allows them to self-restart in case of a power outage and enables them to work with hardly any maintenance. The only regular maintenance required for the units is cleaning and washing the removable filter. These portable air conditioning units work with a standard outlet permitting an easy and effective start up. Our portable conditioner systems work well with generators as well, so we can provide a solution for virtually every working condition. 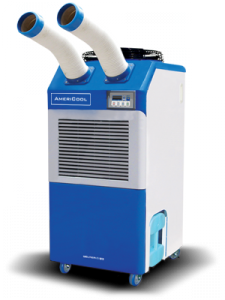 AmeriCool offers a portable data center air cooling solution for companies large and small. Ranging from 1 to 5 tons, we have several different portable air conditioner product options designed to work in every condition and level of work necessary. Our product line starts with a very affordable, versitile and straightforward cooling unit, the WMC-2500, equipped with 4 installation options, an extremely capable 10,000 Btu/h cooling capacity and an operating range of 64-113 Degrees. 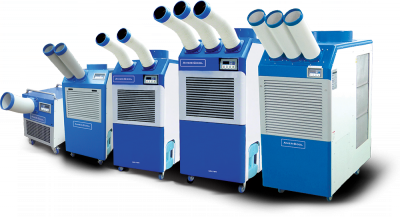 The WPC-4000, has a cooling capacity of 16,000 and two nozzles, an included condensate pump, and also includes a water cooling feature. Each air conditioner also has optional accessories; such as a 16 FT temperature sensor line, air plenum adaptors and a convenient condensation pump kit. All of the condensate pumps have a check valve to prevent condensate water flowing back into the pump itself. AmeriCool’s priority is providing the utmost quality along with the highest level of service to our customers, offering 24/7 support whenever needed. You are getting more than the best air conditioner, you are investing in a solution for all of your cooling needs.